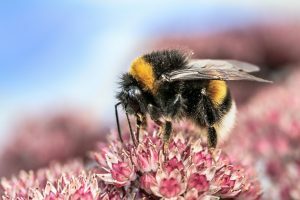 (Beyond Pesticides, March 13, 2019) A study on the impact of two neonicotinoid pesticides shows differential gene expression in bumblebees (Bombus terrestris) after exposure. Considering the current worldwide plight of insects, the authors of point to the cutting edge research as both a reason and a methodology to more carefully examine the effects of pesticides. “Caste- and pesticide-specific effects of neonicotinoid pesticide exposure on gene expression in bumblebees” was published in the journal Molecular Ecology in early March. Researchers fed variable colonies with clothianidin or imidacloprid-laced sucrose. They analyzed gene expression in the heads of worker bumblebees and colony queens using RNA sequencing (RNA-seq), inspired by biomedical techniques. This approach allowed for new insight on what genes and pathways are affected by neonicotinoid exposure. Clothianidin had a stronger impact on bumblebee colonies, changing the expression of 55 genes in worker bees and 17 genes in queens. The affected genes are involved in important biological processes such as mitochondrial function. Researchers noted with interest that there was almost no overlap between the genes that were impacted in queens versus workers. Comparatively, imidacloprid altered expression of only one gene in workers. The divergent effects of these two similar pesticides indicates distinct genetic mechanisms of toxicity. Previous studies of neonicotinoids have found sublethal effects on bee learning and memory, cognition and problem solving, motor function, foraging performance, navigation abilities, and immune system – but have not delved deeply into the genetic process by which these deleterious effects occur. “While newer pesticide evaluation aims to consider the impact on behaviour, our work demonstrates a highly sensitive approach that can dramatically improve how we evaluate the effects of pesticides,” says Dr. Wurm. The European Union banned the use of neonicotinoids in 2018, but these pesticides are still widely used in the U.S. and elsewhere. Beyond Pesticides holds the position that we must commit to complete transformation of our agricultural system if we hope to stave off the dire fate of total, devastating insect decline. Beyond Pesticides is a resource for activists pushing to end pesticide use and adopt least-toxic, organic practices. Join the movement to end destructive pesticide use by engaging at the local, state and federal levels to transform our agricultural system. Our tools for change serves as a resource to help individuals organize their communities. This entry was posted on Wednesday, March 13th, 2019 at 12:00 am	and is filed under Bayer, Imidacloprid, neonicotinoids, Pollinators, Uncategorized. You can follow any responses to this entry through the RSS 2.0 feed. You can skip to the end and leave a response. Pinging is currently not allowed.